AVALON — Early registration is now open for the Feb. 21 Avalon Underwater Cleanup, an annual dive event held at Avalon Harbor. The event was started in the 1970s by local scuba divers, in an effort to clean the waters of Avalon Harbor — and this yearly event is the only time diving is permitted in the harbor. Over the years, the cleanup has grown to become one of the most popular dive events in Southern California. In years past, more than 500 divers have participated in the cleanup, retrieving underwater trash and lost items from the harbor, as well as joining in the event’s shoreside activities. Several dive clubs also have made this event one of their premier social events of the year, and numerous parties are scheduled in Avalon on both Friday and Saturday nights. 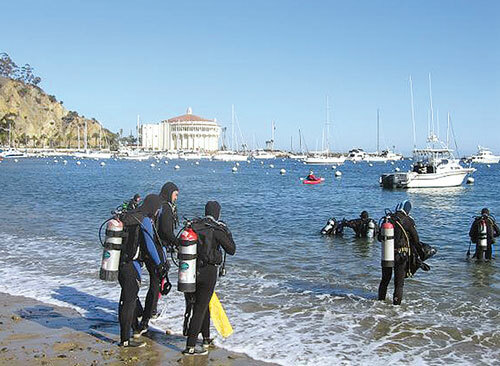 Proceeds from the 34th annual Avalon Harbor Underwater Cleanup benefit the University of Southern California Catalina Hyperbaric Chamber, a 24-hour emergency recompression facility on Catalina Island that serves thousands of divers; and the Catalina Conservancy’s Robert R. Given Fund for Ocean Conservation and Educational Outreach. After the cleanup, divers and volunteers will gather at Avalon’s Wrigley Stage, where an awards ceremony will be held. Prizes will be presented to divers who bring in the most unusual items found underwater. Registration is available online at catalinaconservancy.org. The cost is $50 per person through Feb. 22. On-site registration will be available the day of the event, from 7 a.m. to 8:45 a.m., at $60 per person. However, early registration is encouraged, as late arrivals are not guaranteed participation in the event. To be eligible to dive in the Avalon Harbor Underwater Cleanup, participants must be trained scuba divers certified by any national agency recognized by the Recreational Scuba Training Council.